Invited to use Fight Against Hate? 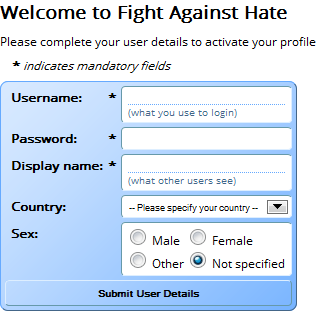 Click here if you wish to invite another user to register with Fight Against Hate. You have been given an invitation to Fight Against Hate, an online system for reporting and monitoring reports about online hate in social media. When you register using an invitation, you will be added to the team of the user who invited you. Go to the link provided in your invitation email. If the link is valid and has not already been used to create an account, then you will be presented with the options for completing your registration. Fill in your details and click Submit User Details to complete your registration. * Location and gender are not essential, and can be updated later in your user profile, but are useful for us to determine what demographics are encountering particular types of hate content. It is essential that you select a valid username, password and display name to be able to activate your account. An error will display if a user by that name already exists, in which case you will need to select a different username. Once you submit your valid user details, a status message will confirm that your user profile has been created. You will then be directed to login using your new username and password. Now that you have registered, you can proceed to Reporting in Fight Against Hate.